Corona Scalping System is a trend-momentum strategy based on the corona indicator, snake force and other momentum indicators. Time Frame 1 min or higher. This forex system works on all time frame. Currency pairs EUR/USD, GBP/USD, AUD/USD, EUR/JPY, AUD/JPY, GBP/JPY and other. 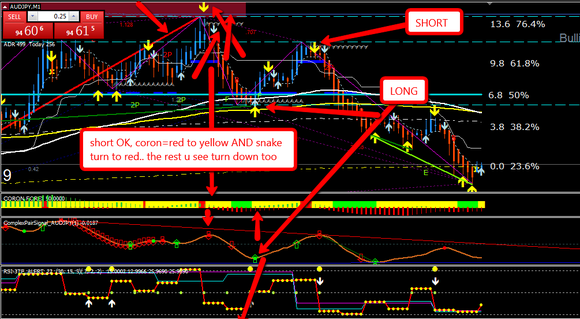 Corona Indicator green to yellow, snake indicator turn green, the other indicators show trend up. 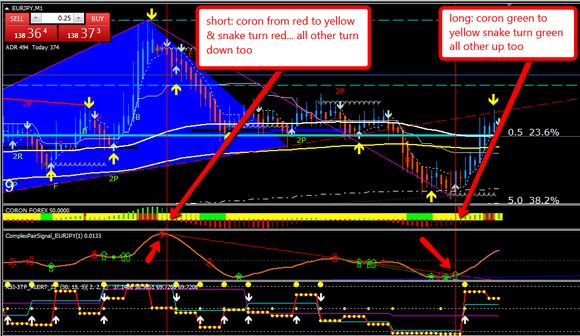 Corona Indicator red to yellow, snake indicator turn red, the other indicators show trend down. Stop loss ok the previous swing. Target Profit depends by time frame and currency pair. In the pictures Corona forex scalping system in action.